Serve with home-made sweet potato chips for extra flavour! In a small bowl, combine the basil, ½ lemon juice, mayonnaise and 2 tablespoons water. Set aside. 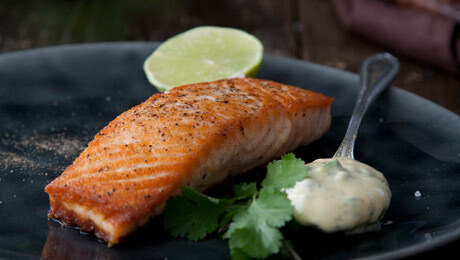 Heat a large non-stick frying pan, over medium heat and drizzle with oil and add the salmon, skin side up. Season with salt and pepper. Fry for 2 - 3 minutes without turning over the salmon to create a crust. Then, Turn the fish on the skin side and lower the heat to medium to low. Continue to cook for a further 10 – 12 minutes until the flesh is firm to the touch. Remove from the pan and serve with the basil mayonnaise and wedge of lime.